Carica. (From Caria, erroneously supposed to be the native home of the pawpaw.) PAPAYA; PAWPAW; MELON TREE. Caricaceae. Twenty two species of pachycaul trees and shrubs, often dioecious. Trunks usually unbranched, thick, somewhat succulent, containing acrid latex and marked with distinct petiole scars. Leaves alternate, carried toward summit of trunk and in a spreading apical crown, palmatifid and incised; petioles long, stout, terete. Flowers white, yellow or green, borne in axils of leaves or, more commonly, emerging from petiole scar on exposed upper reaches of trunk; calyx and corolla 5-lobed; male flowers in racemes, corolla tubular-salverform, anthers 10, female flowers solitary or paired with 5 erect, free petals, single style, stigma 5-lobed, ovary superior, 1-celled. Fruit a large berry, short-stalked and hanging below leaves. S America. 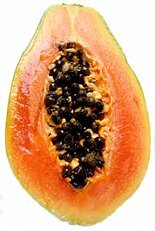 Carica papaya (paw-paw, papaya), transported via the Portuguese trade routes from its native South America, is now of great commercial value throughout the tropics and frost-free subtropics. The unripe fruit is the source of the protein digesting enzyme papain, extracted by scratching the skin, which has a multitude of medical, cosmetic, and industrial uses; for tenderising meat, (in China, it is applied to ancient chickens), in clarifying beer, in de-gumming natural silk, and in giving shrink-resistance to wool, and is used at almost every stage of its development. The vitamin-rich fruit with deep yellow or salmon-coloured flesh, has a firm, creamy texture and a delightful flavour reminiscent of melon and apricot. It is eaten when ripe as a dessert or breakfast fruit, and as a cure for haemorriods and constipation. Unripe fruit is cooked as for squashes, in preserves or fermented into a kind of sauerkraut. Carica pentagonia (babaco), being more cool-tolerant than the tropical papaya, is commercially cultivated in New Zealand and Guernsey. A number of other species, such as the mountain papaya, Carica candamarcensis, and the oak-leaved papaya, Carica quercifolia, also have commercial potential in similar warm temperate zones. In tropical and frost-free subtropical zones, grow Carica papaya in fertile, well-drained loam soils (trees in waterlogged soils die within a few days). They are killed or badly damaged at temperatures below 0ºC, and due to their susceptibility to wind scorch should be grown in sheltered locations. 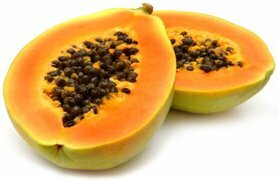 Although papaya will tolerate lower temperatures than many tropical subjects, growth is reduced and fruit flavour much impaired; a sunny climate, with an optimal temperature range of 24-26ºC and 100mm of rain per month, is required for production of high-quality fruit. Keep young trees weed-free for their first few months, preferably and hand-weeding, since the surface feeder roots are easily damaged; later, use an organic mulch. In commercial orchards, they are often grown with a cover crop. The fruit is borne directly on the trunk, in the leaf axils, and Carica papaya are more commonly grown and fruited as a single stem, although it is possible to encourage side shoots by pruning the tips when the plant is about five months old. For home consumption, papayas are best ripened on the tree and are thus usually sweeter; they can also be picked when semi-ripe, and stored at 7-10ºC, for 2-3 weeks. Fruit for export is harvested when firm and green, with a touch of colour on the lower parts, since in this condition it bruises less easily; it may be ripened at 16ºC. Carica pentagonia and other species which occur naturally at higher altitudes are tolerant of lower temperatures, but even in cooler subtropical climates will produce fruit of better size and flavour if given a warm micro-climate; otherwise they enjoy similar conditions to Carica papaya. In temperate zones, Carica papaya makes an unusual foliage plant, with dark green, deeply lobed leaves borne in palm-like clusters, although it is short-lived, and should be replaced approximately every four years. Grow in large, well-crocked pots or tubs in the glasshouse or conservatory, in full sun, with a minimum water temperature 15-18ºC. A hermaphrodite such as Carica papaya ‘Solo’, with fragrant trumpet-shaped flowers in summer, will bear fruit, if pollinated by hand, with 4-6 months from flower to mature fruit in ideal conditions. Liquid feed with a high drainage is essential, since the stems are killed very quickly in waterlogged conditions. Thin fruits to ensure good quality and to reduce pest damage, (fruit clusters provide cover for insects). Fruit ripening and development of good flavour is dependent on adequate warmth, (at least 16ºC) and low humidity. Propagate from seed, washed and dried after removal from the fruit; sow in spring, in pots of well-drained and sterile propagating mix, at 24-30ºC, and in indirect light. Germination takes between 2-6 weeks. Transfer to a sunny position at two weeks; growth thereafter is rapid, and plants may bear fruit within two years. Also by greenwood cuttings, in a closed case, or under mist with bottom heat, and by grafting. Seedlings are especially prone to damping off, Phytophthera and Pythium species. In warmer regions, several virus diseases cause serious damage to crops and the aphids and hoppers which transmit them should be controlled. White scale if detected early can be scraped off. Fruit is also prone to anthracnose fungus. Under glass, Carica may be attacked by red spider mite and thrips. 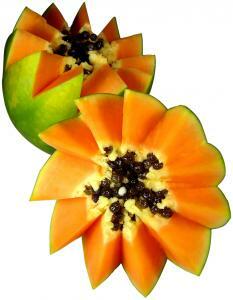 Carica papaya occurs in male, female and bisexual forms, fruit from female plants is usually spherical, while bisexual plants yield the more familiar pyriform fruits. Seed from a female plant pollinated by a male, yields 50% female offspring, 50% male. A self-pollinated bisexual tree gives rise to a ratio of 2:1 bisexual to female offspring. In the commercial situation, all males are removed from orchards of bisexual trees, and in orchards of female trees, only 5% of males are required for pollination. 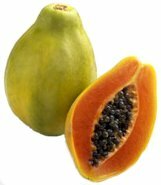 PAPAYA; PAWPAW. Trunk to 10m, stout, conspicuously scarred, always unbranched. Leaves to 70cm diameter, deeply palmatifid, lobes 7, oblong-elliptic, deeply incised, dark to mid-green, soft-textured, puberulent; petioles to 1m, spreading to ascending, ulimately reflexed. Flowers usually unisexual, rarely bisexual, male flowers in racemes to 80cm, corolla narrow-tubular; female flowers wider than males, solitary or clustered. Fruit to 45cm, elongate-globose to obpyriform, hanging on stout stalks below leaves and clothing uppermost portion of exposed trunk, skin leathery, olive green sometimes ripening yellow-orange, pulp fleshy, apricot to salmon pink; seeds numerous, black. S America (lowlands), cultivated throughout tropics. ‘CO-1’: dwarf; flesh sweet, yellow. ‘Coorg Honey Dew’: fruit large, oval; flesh firm, orange-yellow. ‘Know-you No. 1’: fruit early, flesh yellow; some resistance to papaya ring spot virus. ‘Ranchi’: semi-dwarf; fruit oblong, flesh sweet, dark red-orange. ‘Simla’: dwarf; fruit skin pale yellow at maturity, flesh deep orange. ‘Solo’: female and bisexual; female fruit round, bisexual fruit pyriform; flesh very sweet, golden-orange. ‘Sunrise’ (‘Sunrise Solo’, Strawberry’): fruit pyriform, flesh orange-red; fast-maturing. ‘Tainung No. 1’ and ‘Tainung No. 2’: semi-dwarf, early maturing; fruit oblong to almost round, flesh orange. ‘Vista Solo’; self-fertile, compact; fruit to 45cm; flesh very sweet but needs high temperatures for full ripening. ‘Washington’: fruit medium to large, oval; flesh very sweet. ‘X-77’: dwarf; fruit small; flesh dark yellow-orange, very sweet. MOUNTAIN PAWPAW. 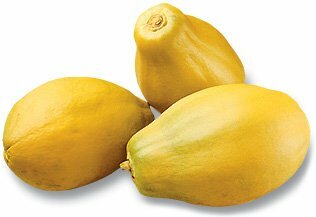 Differs from Carica papaya in its shorter, stouter trunk, 5-lobed leaves to 30cm diameter, fruit to 25cm, ellipsoid, strongly if obtusely 5-ribbed, dark green ripening deep yellow. S America (Highlands). To 5m, habit usually shrub-like with a sparsely branched main stem. Leaves to 30cm, 3-lobed, the lobes broadly sinuately toothed as in Quercus velutina. S America (Highlands).